CATBALOGAN CITY — Domestic airline, Air Juan Aviation Inc., opened a new route to Samar province, its fourth destination since it started operating in the Eastern Visayas region last year. Air Juan chief executive officer John Gutierrez said during the maiden flight for the Cebu-Catbalogan route on Saturday that the company wants to become competitive with the ferry system in the country. “We want to become competitive with our ferry system. But we also want to make our passenger understand the value of time,” Gutierrez said, referring to the hours wasted by Catbalogan travelers to get to Cebu via the ferry system and other means. From Catbalogan City to Cebu via the Calbayog City airport, a passenger needs at least three hours of travel time, including the waiting time at the airport. If one will use the Tacloban Airport, a passenger has to spend four hours from Catbalogan to Tacloban and to Cebu. But for those who will use fast-craft in Ormoc City in going to Cebu, passengers have to allocate at least eight hours, traveling from Catbalogan to Tacloban then to Ormoc City using vans, then fast-craft to Cebu. “That is very tiring, especially for those who are seeking medical attention. That is why we urge passengers from Catbalogan to travel by Air Juan because it will only take them less than an hour to reach Cebu,” Gutierrez said. 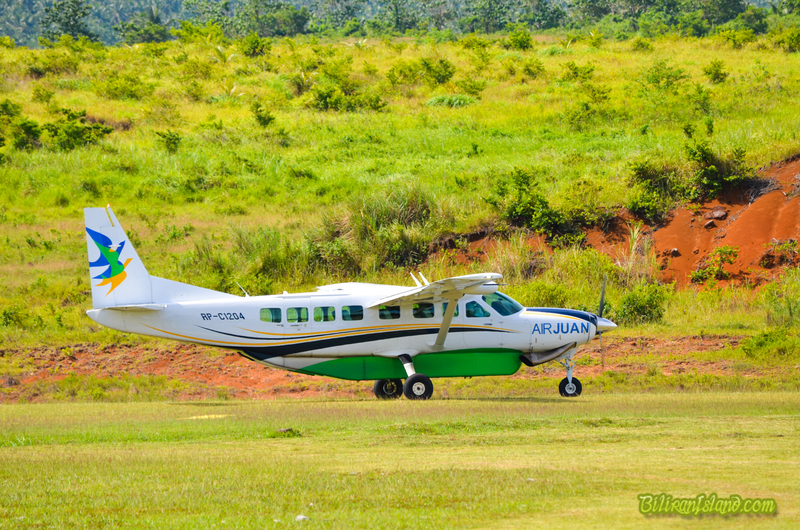 Currently, Air Juan has twice weekly flights to Catbalogan every Monday and Saturday. The nine-seater plane leaves Mactan Cebu International Airport 11 a.m. and reaches Biliran Airport after an hour. After a stop-over in Biliran, the plane will fly to Catbalogan Airport to deplane passengers. But if it is fully booked in Catbalogan, the plane will no longer make a stop-over in Biliran to pick up passengers, according to Gutierrez. He assured that if there is an increase in demand, they would add more flights to the capital of Samar province. Mayor Stephany Uy-Tan considers the operation of airline companies at the Catbalogan City Airport as long overdue. For several years, the mayor has been pushing for commercial flights at the city’s community airport built in 1995. “This is one of the elusive dreams of the people of Catbalogan that is for the airport to operate. This first commercial flight is everyone’s aspiration for many decades now. The challenge was overwhelming and it seems that it was impossible,” Uy-Tan said. The city mayor thanked those who helped achieve their dream for the city’s airport. Among those she mentioned was the late Philippine News Agency stringer Vicky Arnaiz, who provided contact details of the airline firm. She recalled that Arnaiz was the first one who talked to Air Juan officials and convinced them to consider flying to Catbalogan. The city mayor also thanked President Rodrigo Duterte, Department of Transportation (DOTr) Secretary Arthur Tugade, Presidential Management Staff Undersecretary Ferdinand B. Cui, and Civil Aviation Authority of the Philippines Director-General Jim Sydiongco for helping the city government to achieve their goal after their talks with the airline executives. “This Catbalogan City Airport project is a necessity from the national government standpoint, not just from the standpoint of tourism development, but equally important for disaster risk reduction and management,” Cui said. “The more access point we have for tourism purposes and for post-disaster response, overall that is highly beneficial to the Eastern Visayas region,” he added. Aside from Catbalogan, Air Juan also services the Cebu-Biliran route since it opened in June 2017, the Cebu-Maasin-Tagbilaran route in August 2017, and Cebu-Ormoc route last week. With a direct flight from Cebu to Catbalogan and a plan to open a direct flight from Manila to Catbalogan, this will help investors to reach the city easier and faster to see the city’s investment potentials. The city mayor added that the Cebu-Catbalogan flight will also help the Spark Samar Development Agenda of the provincial government that pushes for tourism as the main driver of countryside development. Cui added that with the opening of the first commercial flight in Catbalogan, the DOTr will fast-track the airport’s improvement as promised by Tugade. Tugade visited the Catbalogan Airport in August 2017 with plans to expand it by 2018, being one of DOTr’s priority projects.